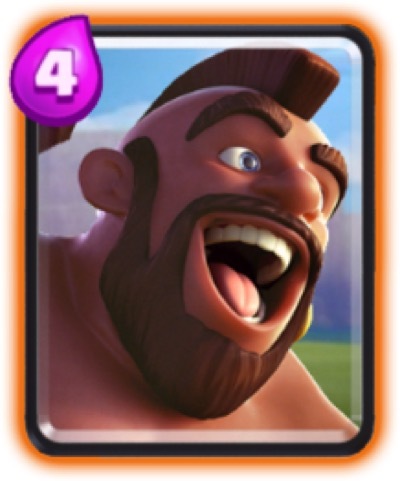 Just a few days ago, Supercell added a new Legendary card to Clash Royale. 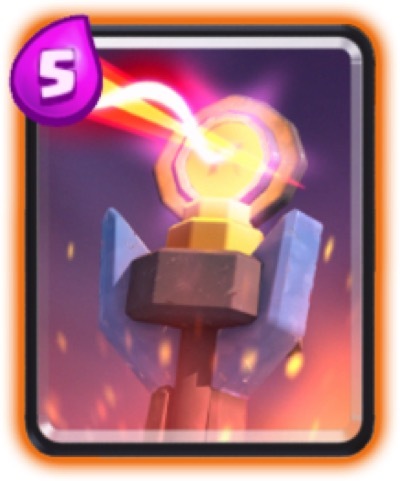 This newest one is the Inferno Dragon, which is basically the power of an Inferno Tower (damage increases on a single target over time) with the mobility of the Baby Dragon. As an avid Lava Hound user, this is great news. 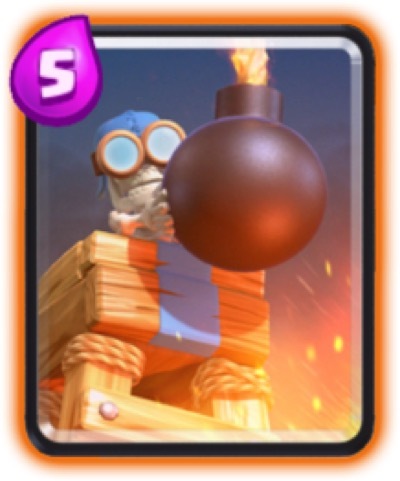 The Lava Hound’s value is greatly increased by this new Legendary, as the Inferno Dragon is going to work best with a tank in front of it. Personally, I’ve had a lot of success with a Lava Hound/Balloon combo that’s both very strong offensively but also very exploitable. The Inferno Dragon would take this up a couple of notches, since it can attack both air and ground targets, whereas the aforementioned Lava Hound/Balloon combo head straight for the nearest building and can be easily distracted. So let’s take a look at how you might want to diversify your deck to maximize the use of the Inferno Dragon. As I mentioned before, the Lava Hound should be a great companion to the Inferno Dragon, but you’ll also want something that can protect the Inferno Dragon from archers, minions, or the mega minion. I’m taking a cue from BossLB who assembled a pretty killer deck that took care of a Giant/Sparky combo without even breaking a sweat. Let me put on my announcer cap and give you a quick play-by-play. In the first image, BossLB has put down an elixir collector, and the opponent has played a sparky right by the Crown Tower. BossLB waits until elixir is maxed out, and then plays the Lava Hound right behind the left tower. In the second image, the opponent has put a mini-Pekka behind Sparky, and a Giant in front of Sparky. 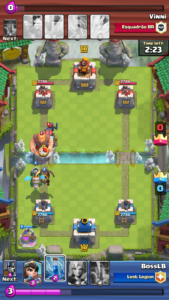 Boss LB plays the Inferno Dragon which is going to lock onto the Giant and hopefully take it out before it reaches the tower. For Image 3, BossLB laid down a Valkyrie, which distracted the Sparky and discharged, nearly killing the Valkyrie. But at least the tower is spared. The mini-Pekka takes out the Valkyrie, so now the Sparky and mini-Pekka have a clear path to the tower. 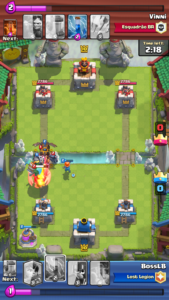 The Inferno Dragon is locked onto the Sparky, but it discharges and deals 1300 damage. Ouch. Here BossLB uses Guards as a counter to distract the mini-Pekka while the Inferno Dragon and tower deal damage. Two guards survive, and with the Inferno Dragon, begin to head towards the tower to wreck shop. The opponent drops a horde of minions on the Inferno Dragon, but at nearly the same time, BossLB has placed a princess that can take the horde out in two shots. The Inferno Dragon survives, although barely, and there’s now a clear path to the tower. 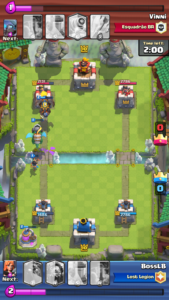 BossLB has two Guards, a Lava Hound at 40% HP, an Inferno Dragon, and a princess all ready to lay the smack down, and the opponent has one elixir in the bank. Unfortunately for BossLB, the opponent has arrows and isn’t afraid to use them. 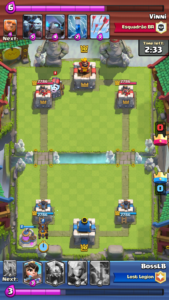 The arrows take out both the Inferno Dragon and the Princess, and the tower has about 500 HP left. At that time, the Lava Hound breaks down into Lava Pups and finish the tower off. The opponent’s elixir is drained and it can’t counter. Boss LB ends up winning the match 2-0. 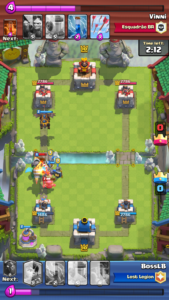 The opponent has to play defense for the rest of the game and actually does a great job at it, but eventually the elixir is coming so freely that BossLB is able to lay down multiple Inferno Dragons at the same time which just lay Giants and mini-Pekkas to waste. 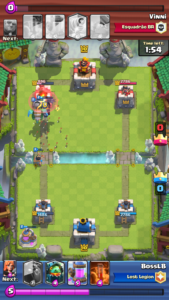 Outside of the initial Sparky blast, the opponent wasn’t able to land any tower damage at all. I’m pointing out this specific match because the opponent actually had a pretty decent deck for countering the Inferno Dragon – minion horde, poison, and even arrows/zap can do enough damage to destroy the Inferno Dragon before it even reaches the tower. But the beauty of the deck is that the opponent has to use so many resources taking out the Inferno Dragon that the tank may end up doing the brunt of the damage. If not, the Inferno Dragon will take out those towers in no time. 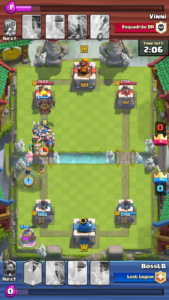 For additional countermeasures when facing the Inferno Dragon, I’d recommend laying down a Skeleton Army while archers or air troops focus on the Inferno Dragon, unless princess or poison is in the deck. Mega minion might be great here too, if the Inferno Dragon is distracted and minions/minion hordes are taken out with arrows or poison. 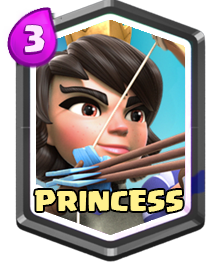 If you’re like me and may not have some of the cards in BossLB’s deck, you can substitute a Giant for a Lava Hound, and minions for the Princess. I’m actually not fully convinced that the Elixir Collector is needed here, so if you think a different building of some sort might be appropriate in the deck to distract troops, try it and see how it goes. No offense, but no matter what you do, inferno dragon will be killed, so why not just use ice wizaed or electro wizard? You really need another card that can actually attack the tower without dying, like giant. 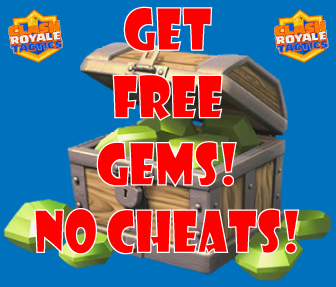 Great strategy, thanks for the info! I still don’t have Inferno Dragon yet, but I’m able to gain a lot of knowledge from commenters such as yourself and opponents also. So far, I usually lay down a Skeleton Army or Minion Horde to counter. I’ve lost my fair share of Inferno Dragon matches but I don’t find it as difficult to defend as other cards. Thanks again for the deck suggestion!